Those of you who know me are aware I will try and LOVE all sorts of styles but I'm usually a less is more sort of artist and a vintage palette, soft colours and lots of white space are my niche....however there are times when a riot of colour is needed. As I chose the challenge I wanted to encourage you to use bright colours and share a way of using lots and lots of zingy hot shades without it being overpowering and have you reaching for the sunglasses! Firstly choose colours adjacent on the colour wheel, pink (a tint of red) and orange are great together, so pick out a few of each. 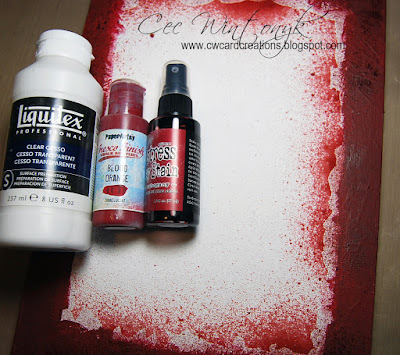 I'm using PaperArtsy fresco acrylics, my go to...they dry fast and have a mix of opaque and translucent colours and when it comes to layering you need a mix. I adhered a piece of 8x8 Canson mixed media paper to some grey board and roughly brushed some slightly diluted Blush paint all over as a base. Patchy is fine, just get a little colour on. 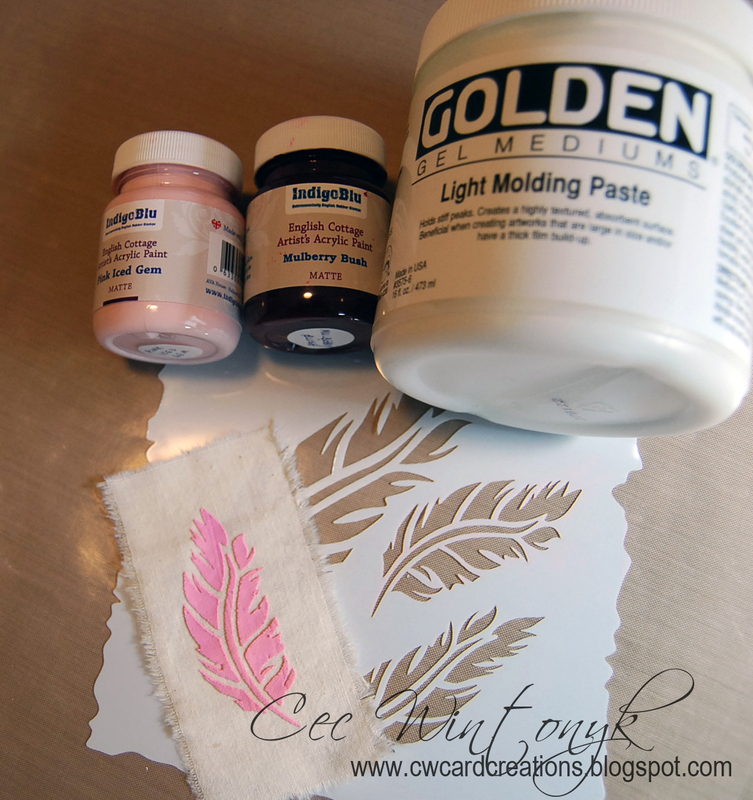 Next choose some stencils, I used bubble gum at first, one of the darker shades and an opaque. I start darker and then lighter paints will help knock back if needed. I picked out some matching archival for later stamping. I kept some areas mainly pink, some mainly orange and some a mix. This is Coral, one of the darker orange shades and a translucent. I added Bougainvillea (the darkest pink shade) and rose and then Tango. I hope you can see the layers building and where the translucents are, showing the colours beneath, I think this is where the 'magic' happens, how the depth gets created retaining a lightness in the layers. I always used to think that the darker shades would be opaques and lighter shades translucent but it's frequently the reverse, a lot of the lighter shades are 'tints', colours mixed with white and white is opaque so most light colours are opaque.....well that's my thinking anyhow! Then you start to fill up the gaps with tiny stencils, in retrospect I could have stopped at this stage and would have been happy but I hadn't used any stamps and wanted to test how much was too much. Adding in the stamps gave more depth and more interest for the eye to travel across, I also finger painted with some white gesso, just dabs which lifted the piece. Some may call it a hot mess....but it sure makes my heart sing....lovely bright colours on a grey day! I decided for some extra 'pop' to coat with a couple of layers of gloss glaze sealing it all in nicely and giving a lovely sheen. Instead of mounting on greyboard, you could just use the mixed media paper and treat it like a master board, using sections of it...but I wanted it to be a piece of wall art. I looked through my mdf words and found 'Inspire', just perfect. Painted with a mix of bougainvillea with an addition of blueberry and black and then swiped with black archival before glazing with a pearl glaze creating some lovely texture. When it comes to mounting, this is where I would use white space and have a deep mount and a simple white frame. I haven't framed it yet but the way I've photographed it in this last pic hopefully gives an idea of how it would be viewed and not appear overpowering. Hello and welcome back ! 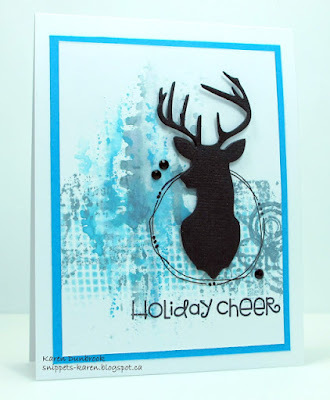 Today we are welcoming Lula as our Guest but as the title suggests this is a double welcome as Lula is also joining the Stamps and Stencils Design Team ! So, let's move on to hear from Lula and please give her a warm welcome. First of all let me say I feel so honoured to be invited here and have a possibility to introduce my work. I started my crafting journey 7 years ago. What or who inspired you to start crafting ? 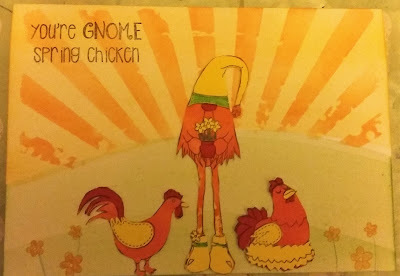 I was inspired by my son's friend (much younger than me) who invited me for a card-making meeting. I love all of them but mixed media is definitely my favourite thing. I'm never satisfied doing things the usual way, so I'm always trying to find ways to be a bit different. What is your 'go to' product and why ? Definitely gesso is the product I use all the time. It is such a versatile product: primer, texture maker, highlighter, transfer medium...etc. Love using both white and black. I would like to take a class with Seth Apter. I think he is a large format artist and his mixed media masterpieces are so inspiring! Love his grunge style. What's your favourite style of crafting i.e. 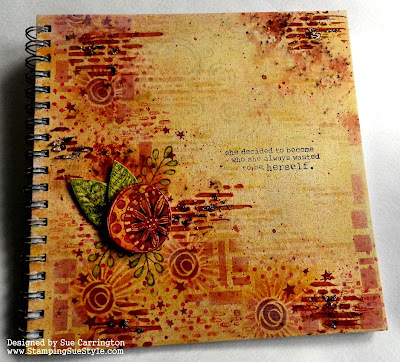 journalling, altered items etc.. ? 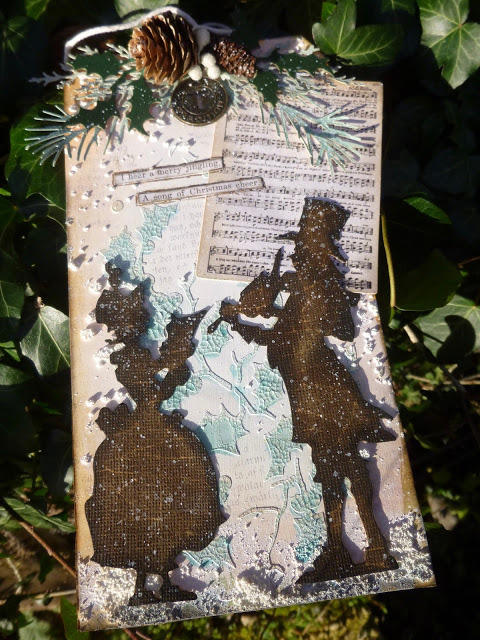 I enjoy making almost anything from tags to art journaling, but I love altered art projects and creative upcycling always makes me happy. My inspiration come mostly from long walks and nature watching, reading books and music I listen to. We are so excited that Lula is joining the team and as you can see Lula's work is just stunning ! The current challenge On the Bright Side still has plenty of time to go, so it would be great to see your entries ! It is Cec here and today I am bringing you a fabric collage that makes use of lots of bits and pieces you have lying around along with some stamping and stenciling on fabric. There is absolutely no right or wrong way to create this type of collage but I do recommend that you just dive in and start adding things because I wasted time trying to lay everything out ahead of time. 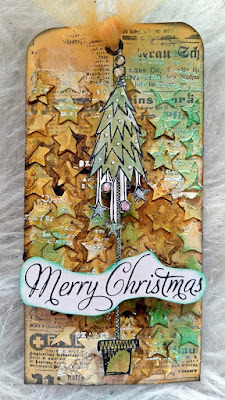 I did decide where the stamped and stenciled pieces were going to be but for the rest, I made it up as I went along. I also did not want it to look perfect so I didn't take a lot of care lining things up or making sure the edges were at right angles and I sure succeeded - LOL. First I decided how large I wanted to make the finished piece and then cut two pieces of canvas fabric a bit smaller. They were sandwiched with a piece of quilt batting in between and then I stitched around the edge a couple of times moving the fabric so my stitching was not straight. 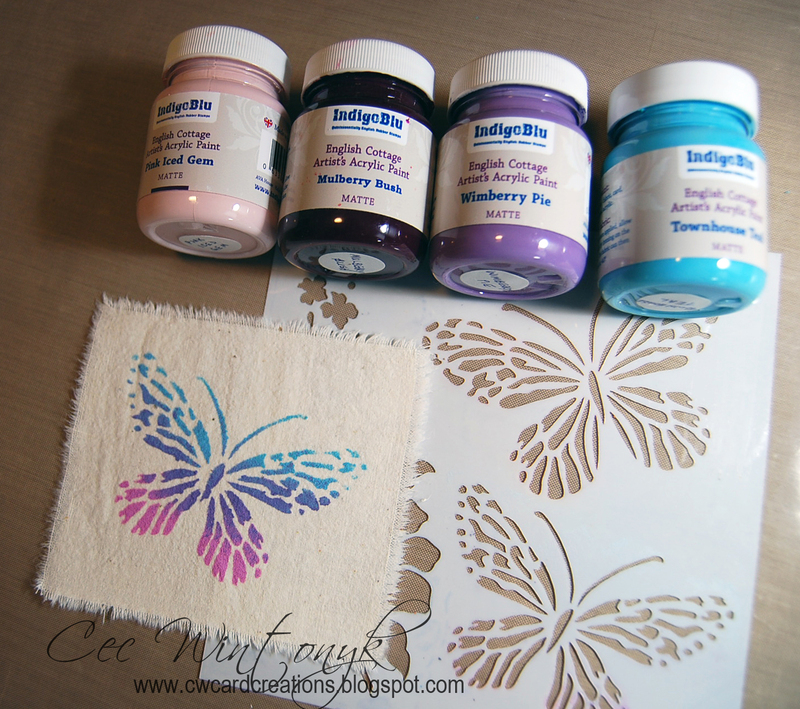 The next step was to stencil a butterfly (IndigoBlu) onto some lightweight canvas fabric using a variety of acrylic paints - Pink Iced Gem that I mixed with a bit of Mulberry Bush, Wimberry Pie and Townhouse Teal (all IndigoBlu). 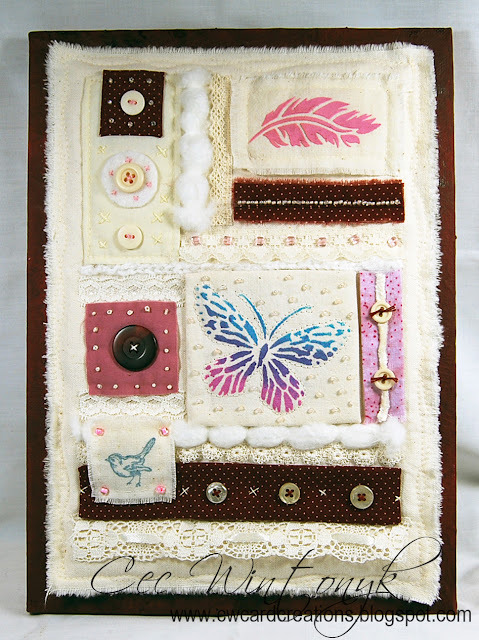 When this piece was dry, I added it to some quilt batting and hand stitched around the butterfly. I used some double-sided tape to hold the canvas to the batting when I turned it to the back but would not do that again because it is hard to stitch through glue. Another time, I would leave it un-turned and frayed as it is in the photo. I would also stencil the butterfly straight on and not on an angle. I glued a bunch of teeny seed beads (Michaels) randomly around the butterfly. There was some leftover pink paint on my kraft mat so I mixed it with some Light Molding Paste (Golden) and used a feather stencil (IndigoBlu) to add some textured stenciling to a piece of frayed muslin. When it was dry I decided it was too bright so I laid the stencil over it again and inked it with some Victorian Velvet Distress Ink (Tim Holtz). 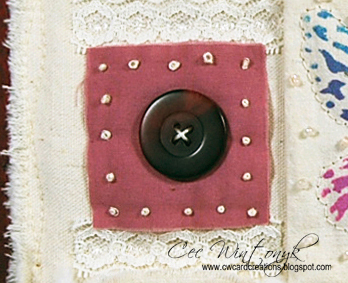 The fabric was then stitched to a piece of quilt batting. 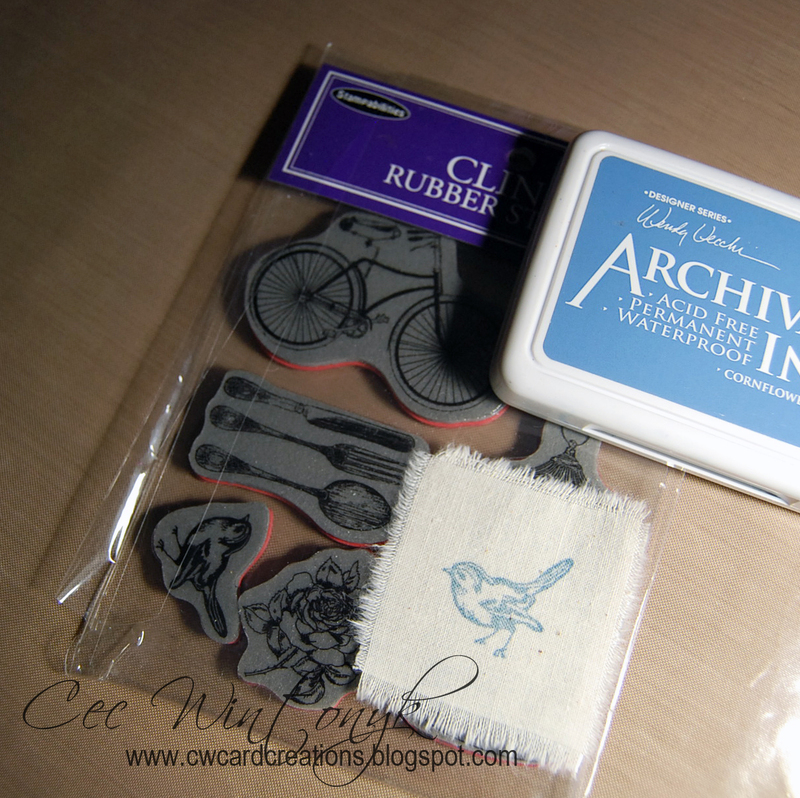 Another piece of muslin was stamped with a little bird from a set called Vintage Outdoors (Stampendous) using Cornflower Blue Archival Ink (Wendy Vecchi for Ranger). This was also stitched to some batting and some seed beads (Dollarama) were sewn in the corners. I went to my sewing stash and grabbed a few scraps I thought might work together and started to assemble the collage on the fabric background starting at the bottom and working my way up. I won't describe every little thing I did because the idea here is that you make this your own and use whatever you have available. There is lots of hand stitching with embroidery floss, including some french knots. I sewed some buttons on as well as some seed beads. I also added some wool and fibres. Sewing the beads took me right back to the time I made a Japanese fan out of seed beads on a bathing suit for my daughter's synchronized swimming competition and the judges at the first level didn't like the colour of the suit (it was the colour of muslin so the fan would pop but they said she looked like she was not wearing anything under water) so they made her get a new suit before the next level of competition. All those little beads and I had to start over and only had one week once the new suit was made for her. Needless to say the fan idea was out and sequins were pressed into service because they were faster to sew on. But I digress . . . .
After I sewed and/or glued everything on my fabric canvas background, I prepared my stretched canvas by adding some clear Gesso (Liquitex) on the top to create a border and on the sides. I purposely put it on thickly and used my brush to create some bumps for texture. When the Gesso was dry I added some Blood Orange Fresco Finish (Paper Artsy) and then when that was dry I gave it a spritz with some Aged Mahogany Distress Spray Stain (Tim Holtz). Finally I glued my collage onto the stretched canvas using Super Thick Slap It On (IndigoBlu). 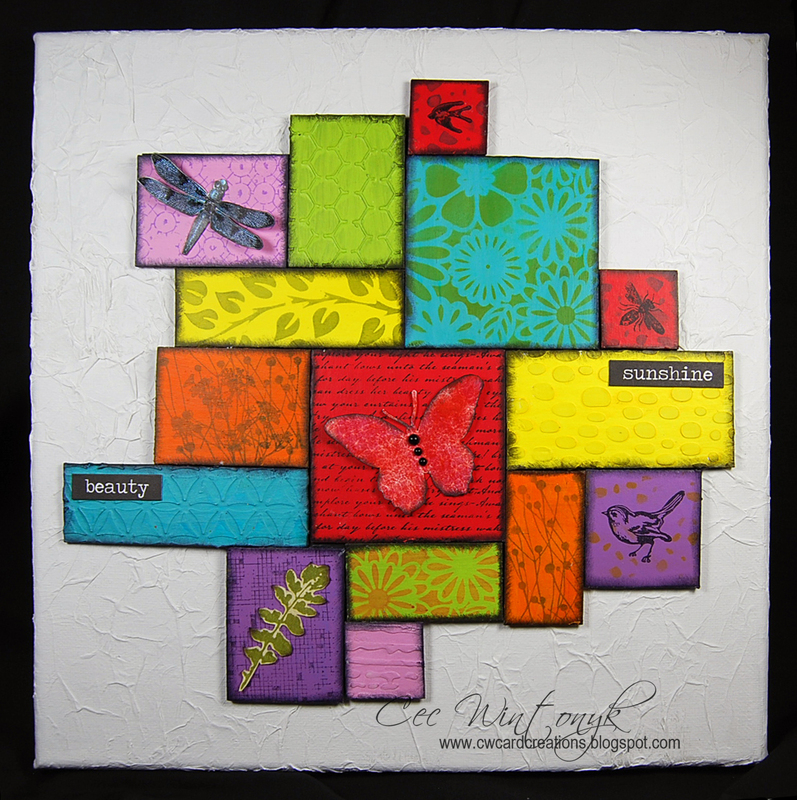 I had fun making this collage and hope I have inspired you to try your hand at stamping and stenciling on fabric. Congratulations Kate ! We loved the textured background and the fabulous Christmas tree is perfect ! Please email carringtons22@yahoo,co.uk for your winners badge and the details of your guest post. The current challenge is On the Bright Side and you still have plenty of time to join us !